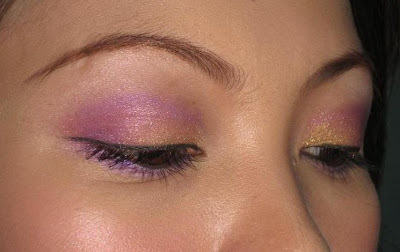 for days now, i've been trying to create a look with 3-4 shades of eyeshadows. but for the life of me, i can't seem to do it...i always end up seeing only 2 at the most. did i blend too much? or the colors i've been using are a lot similar to each other that i don't get to distinguish which is which. i'm sure you only get to see two e/s shades, but i used 3 + a highlighter under the brows. whew. and oh, i bought this MF Miracle Touch Liquid Illusion Foundation (what a mouthful) and i am loving it. it's a cream actually but dries up to a powder finish. but the SA said it's actually a solid to liquid type of foundation. ugh, whatever. i like the way it can cover my blemishes and my really black undereyes, no need to use concealer actually. and i don't get oily...my face looked dewy and still fresh after my 10-hr shift. of course, some oilies appeared on my t-zone but nothing that a good oil blotting paper can take away. i am planning to get another shade lighter and one of their darkest shade for school. hahahah defensive answers sis! But no worries, I love you still.. Sis, true, we really need a light, medium and dark shade talaga.. I was eyeing for MAC NC46 or 47, good thing I didn't buy hehehe of course it would be better if there's cheaper alternatives that works as well :) I can't wait to hear more of your adventures!!!! You can practice on me Jheng! Shall I book a holiday with you even just for a week? Perhaps you can foster me for a while ha ha ha! I can do your pots, clean your house, wash and iron your clothes, take Bogart and Britney for a walk... etc etc! All of those for make up tutorial! hi sis nikki i am thinking of buying NC42 or 47 too since i already have NC15 and NC25. i think i need something in the middle din. thuogh i have 2 bottles of loreal true match na golden beige and vanilla ivory. meron pa guerlain na dark on me...ok na kaya un? kaloka..kagastos! thanks si lizzz but my face is way far from being flawless..mokap lang talga hay! 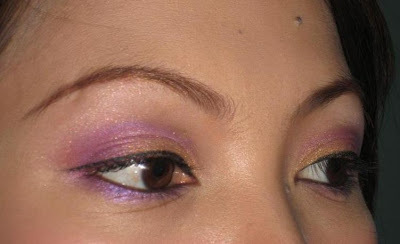 hey nica im using golden something shade...it looks a bit dark on me nga, sabi na kasing acidic ako eh! hehhe i am considering to get 3shades of this baby too for my makeup school. sama ka sa akin one time, makeover kita. ehehhe wag ka lang magagalit pag napagmukha kitang ewan. i am not that comfortable pa kasi on putting makeup on other people. will check out your shade too! thanks mhean for the tips. i try to pack the colors again too once im done blending..then blend uli. kaso naoover blending ata. ewan ko ba, i think im just pressured to finish up all my mmu e/s. i wish i can use them too on my future clients. naks naman parang tunay!